I apologize for dropping out of sight for the last two weeks. Then I get a call telling me that the Apple PowerBook 5300 PowerPC laptop won't be shipped to me as scheduled because of a small engineering oversight that makes the computer burst into flames when the batteries are done charging. Oops. That's not a sales feature in the consumer market. I'm rather dejected, and I send a ""1995 Eivissa (Ibiza): Faxed Plea for Help" back to San Francisco. My ailing PowerBook is sent to Barcelona via SEUR (Servicio Urgente de Transporte). Work on editing book chapters screeches to a halt, and I'm left with scribbling ideas (and this journal) onto my Apple Newton MessagePad. So I'm banging on my Newton something fierce. I'm using Palm Computing's Grafitti handwriting recognition engine together with ICS's "Grafitti Patch" (to place the Grafitti window under the icon strip at the bottom of the Newton's screen). I'm sitting here, scribbling on it's shiny screen, only occasionally looking at what I've written. At least I can write digitally - and only a bit slower than the paper letter that I wrote to Dad this afternoon. (Of course, when i put pen to paper I don't confuse 'i' and 'l', nor 'e' with 's'....) Writing with Grafitti is nowhere as fast as typing on my computer, but at least it's as fast as a pen and in a form ready for putting on the web once my PowerBook is returned. Webmaster's disclaimer: web pages from this date forth were done on a 4-bit greyscale PowerBook 150 that I received as a replacement computer. 4-bit Greyscale: I can barely edit the images I'm including. If one of them is garish, or somehow doesn't work in color, you know why. I'll check them all when I return to the land of plentiful bandwidth and color monitors. On the other hand...: I've been taking a lot of pictures with my Apple QuickTake 100 digital camera. Because I want to include a lot of them here, but I don't want to penalize folks with slow modems, almost every graphic hereafter is pointed to by a thumbnail. The thumbnail isn't just the image shrunk down, in many instances it's a close-up of the person or item about which I'm speaking. I think it'll be worth your time to click each thumbnail to see the full image (which is usally about 70 kb). Mayra and I walked ir y vuelte (there and back) to Cala Sant Vincent, a beach town eight kilometers away. It's got a small beach with some pretty sand, small hotels, and some peace and quiet. On the way back we stopped off at in a very small village (so small it doesn't appear on any map I can find). At a combination grocery/restaurant we quaffed agua con gas (carbonated water) to ward off the incredible heat and sun. All the farmland here, actually most all the land here, is terraced (shown at left). Sheep and goats act as portable lawn-mowers. Horrible erosion is evident wherever rich outsiders have commissioned large homes that don't follow the land-conscious traditional method of building living spaces. Homeowners that renovate existing buildings are the ones that win out. 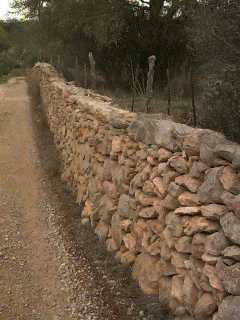 As we walk I notice that there are no wood fences; all fences and walls are made of rocks piled one upon the other. After a bit I see the cycle: geologic forces cause the rocks to move upwards to the surface, which is seen most readily in earth that's cleared (shown at right). Farmers refer to this phenomen as having a field "grow" rocks. 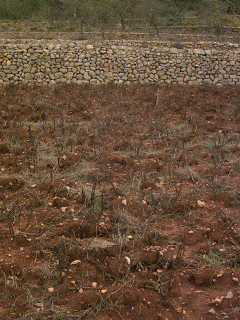 The farmers, seeing their fields growing rocks, harvest the rocks into piles (shown at left). Whenever a wall, fence, building, cistern, well, or doghouse needs to be constructed, a ready supply of building materials is available for use, having been collected during the last planting, tending, and harvesting seasons. The rock wall shown at right is an example of the old school of wall-building. This style walls is found all over the island, most visible to the traveller as walls, boundary markings, and as the terracing material. There are two newer styles of wall building, both more efficient and less pretty than the traditional method. The first is to make an old-style wall and then slap a centimeter of cement on the top, which looks like a demented baker had wandered by. The second is to make an old-style fence and slap cement on the top and front, which looks like a demented fence-builder wandered by.